„Made in Germany“ is a distinction of quality that we take seriously at Industrieanlagen Hlebar (IAH). 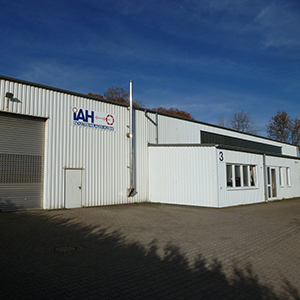 We manufacture all of our products and components in our own factory in Ennepetal, North Rhine-Westphalia. We have no intention of outsourcing our production away from Germany since our most valuable asset is the close cooperation with our customers. We manufacture exactly what you need for your foundry. So it is very important that all steps of the process - from manufacturing to commissioning – are handled by the same company – our company. We know we can rely on our own team of specialists which has 30 years of experience in machine and equipment construction. We can implement your individual product requirements to the highest standards: from the planning through to the commissioning and everything else you need. We are one of the leading manufacturers of special machines for foundry sand preparation. Our aim is not only to supply complete manufacturing plants and components of the highest quality, we also want to support you in the long-term. Accordingly, we also offer maintenance and repair services. The company founder Zvonimir Hlebar expanded the range of equipment we manufacture over many years before passing the business to his son Oliver in 2007. His aim is to expand the excellent reputation of the company abroad as well as within Germany and to supply products of the highest quality in export markets, too.